Don and Phil Everly, better known as the Everly Brothers, had a very successful music career between 1957 and 1973, but split acrimoniously when Don Everly came onstage too drunk to perform live on July 14, 1973. They did not speak for ten years, and only met once in 1975 on their father's funeral. The brothers reformed in 1983 with 'EB 84', an album produced by Dave Edmunds. The track 'On the wings of a nightingale', written by Paul McCartney, was a minor success and returned them to the charts. 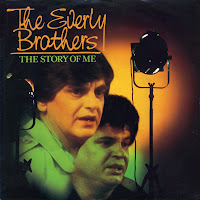 'The story of me' was the second single taken from this album. While this didn't become a hit, it's my favourite Everly Brothers track and until now the only single of theirs that I have in my collection!